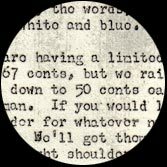 The circular patch features a fully-embroidered blue background with a red outer border and white inner circle. 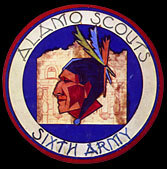 The words Alamo Scouts fashioned in green, log-type script, symbolize the trailblazing nature of the unit and appear in the upper half of the white circle. Sixth Army appears in the lower half. 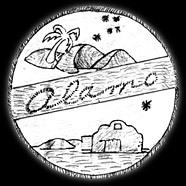 A depiction of the Alamo centered on a blue background refers to the bravery of the Alamo's original defenders, and an Indian head superimposed upon the Alamo represents silent reconnaissance. 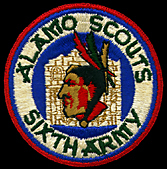 A Filipino-made version of the Alamo Scouts patch constructed on Luzon in mid-1945. 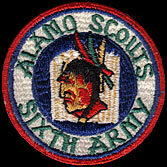 These patches were purchased locally when the original order of 440 patches was exhausted. 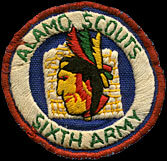 Theater made version of an Alamo Scout patch produced in Japan during the Korean War (1950-53). Courtesy of Alamo Scout James Steele. 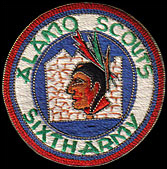 Unknown replica Alamo Scout patch. 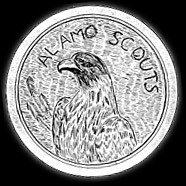 Notification Letter for purchase of Alamo Scouts patch.